Most major international booksellers have Polly Wants to Be a Writer available in their online stores including Barnes & Nobel, Chapters, Amazon, etc. Aspiring teen authors agree that Polly is a must-read if you are serious about writing and getting published. In the wake of her parents’ separation, Polly, a fifteen-year-old wannabe writer, comes face to face with her inner dragon, a truculent, impatient creature who is a talented but frightful critic of her writing. 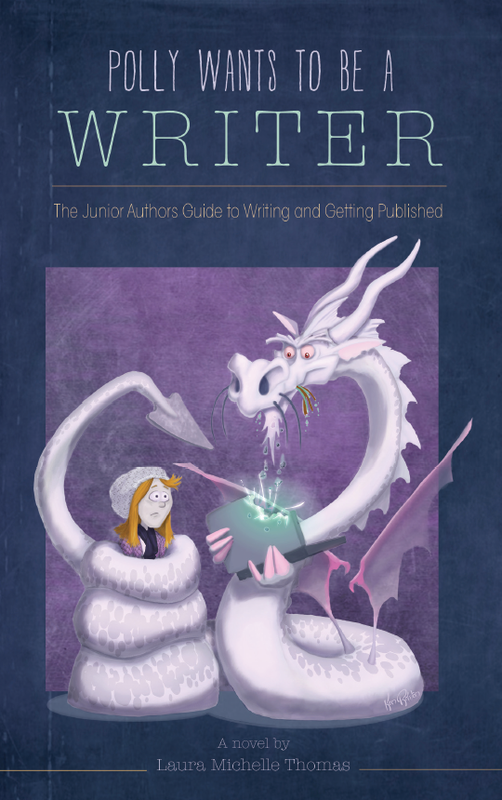 With the help of Ms. Patience Whitford, a literary dragon trainer and leader of a global writing guild, Polly faces the almost impossible task of going beyond her “good ideas” to finish a publishable piece of fiction. All the while, Polly and her dragon become entangled in a dangerous scheme that threatens the future of every writer on the planet. Polly Wants to Be a Writer is an imaginative urban fantasy, complete with nefarious villains, intrigue, complex interwoven backstories, evil plots, and a good deal of solid advice on how to become a writer. It is an engaging read, crafted to capture the imagination of young, aspiring writers. “Ms. Thomas’ greatest accomplishment is that the lessons are seamlessly interwoven with Polly’s extraordinary story. It is a book I would recommend owning, as there is a significant amount to be gained through re-reads.” – Kasturi, Read the entire review in jaBlog! “Not just an instruction manual, and not just a fantasy novel, this book combines two completely different genres into one wholly enjoyable read that I highly recommend for any person pursuing a writing career.” Read the entire review in Teen Ink Magazine. “Would recommend to any younger aspiring writers interested in gaining knowledge of the world of professional writing.” Read the entire review in Teen Ink Magazine. BUY your copy of Polly Wants to Be Writer in paperback or ebook at your favourite bookstore. Looking for the Polly short story workbook? It’s only available in the LTC store. Click here. I loved the book, and if you ever write anything else, Laura, I’d love to read it! Good work on the story! Thank you, Makayla. I appreciate your kind words. Please help me free my literary dragon. i want to be able to write as good as laura thomas someday. Laura, how did you think of the idea for Polly Wants To Be A Writer? Hi Lennox. I had been using the literary dragon metaphor for years, and Polly is an amalgam of the many young writers I have mentored over the years. The story developed as I wrote my first draft. I use my first draft to brainstorm. I don’t usually start with an outline, just a character or scene. The rest flows from allowing my imagination to conjure up whatever it likes. Just ordered Polly at my school library. Can’t WAIT to get my hands on it!